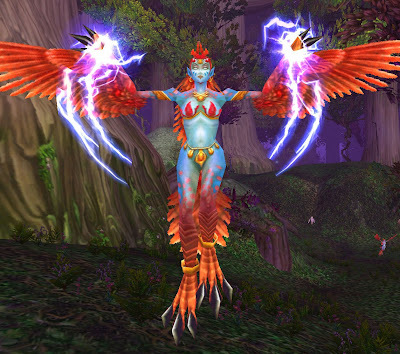 Ive had a feather fetish ever since I hit my very first harpy in the face with a shadowbolt. Not to mention there are plenty of times when I feel distinctly harpyish so getting to play one ingame would be the icing on the cake. The naked bug sure livens up raids.. here we see naked paladins ressing those who fail at Frogger (see how kind I am, I cut out the dead so people can’t laugh at them). Its our first attempt at a video, so most of the editing is non existent. Recommend watching it full screen by clicking on the icon at the top right corner. Its also played back at 4x speed as otherwise it would be longer than Titanic. Notice the 50k spell reflects, warriors make mincemeat out of the spellflingers. Eyes in the dark… is dispellable, but still very very annoying. With the Prince, the fire balls are very predictable. If hes tanked facing your party (obviously the melee still need to run), all the balls should miss the caster group without them having to move. They come out from left, right and straight behind him and as you can see in the video im in no danger of being hit at all. Lots of people say on the forums that he does his Embrace of the Vampyr randomly, its not random. He does it 3 times per kill at around 75/50/25 percent, doesn’t matter how slowly you kill him. As you can see in the video I survive the embrace with only 19k health (fort, commanding shout, food buff), powerword shield does absorb a chunk of the damage and shadow protection helps mitigate it further. I do however swop in some stamina gear. The end boss is a joke. The only “hard” part of the fight is the insanity and of course there only being 2 of you makes it pretty simple. The reason we take so long killing each other is delibrate. I kill Lylia’s clone as fast as possible whilst he kites mine around, then I join him in his “insanity” and mana up. The reason we don’t do it the other way around is because his clone sunders, which means either I have to tank it (losing out on regen opportunities) or he loses a chunk of armor. Or how to 2 man Prince Taldaram on heroic as a holy priest/prot warrior combo. Patience: Its going to take a while. Our first kill took us 14 minutes and 52 seconds, our second was around 11 minutes something. Stamina: You need enough health to survive the full Embrace of the Vampyr as its highly unlikely either of you will have enough dps to break it early. I recommend wearing some pvp/high stamina gear. With commanding shout I was sitting at 18,500 ish which with a PW:shield left me around the 2-3k mark after the embrace, perfectly survivable. However, the more health the better. Tactics: The Prince is a very simple fight, he only has 3 abilities, 2 of which are fight defining and 1 which is marginally annoying when you aren’t carrying any Dpsers. Embrace of the Vampyr = the reason why you need lots and lots of stamina. You basically have to rely on the fact that you will resist some of the damage with shadow protection. Flame Sphere = As usual, fire = bad. Run away from these. Bloodthirst = Annoying when your dps is a prot warrior and a holy priest throwing out dots and wanding. Kiting is the name of the game. On our first kill we went for pulling him to the entrance and back, however today we tried a more simplistic and time saving plan involving just sticking to the space below his platform. Starting from his platform, at the first fire orbs we headed down the steps, tanked him there for a bit before moving in the centre of the room to avoid the 2nd set of orbs and finally heading towards the steps where we entered his area. Its then a case of repeat, repeat, repeat for the next 10 minutes, interspaced with a few embraces ( we have had 3 embraces each time so far which given the fact we shaved a good few minutes off our kill time leads me to suspect it is percentage linked, not time based). As the healer you want to always stay a good 30 yards away from the tank, which saves you having to do any emergency running and helps the tank leave in a hurry with intervene if needed. Whilst neither of you should get hit by any orbs, prayer of mending is its usual awesome self for running away. The Embrace of the Vampyr is random so you can get lucky with your tank getting it every single time as we did today, but as long as you keep both of you at as maximium health as possible and shield whenever you see him start his warning speech there should be no issue there. The embrace is partially resistable so shadow protection should be up, and if its the tank who gets it, start casting a greater heal to land just after the embrace with its 100 percent healing debuff runs out to make sure the Prince’s melee attacks don’t finish him/her off. All in all, its a very easy fight. Because you are kiting for a most of it, mana shouldn’t be an issue, you get plenty of time outside the five second rule. This is particularly true of the Embrace periods, thats my time to wand or lie there thinking of trashy Vampire movies depending on whether I’m the one on the floor or not. Result: One easily achieved Achievement. 1. 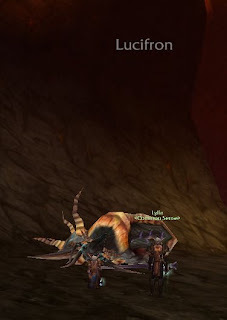 We did our first 25 man on Tuesday night, cleared the spider wing without any wipes. Maenxxa is an angel compared to what she used to be like at 60, poor Lylia always ends up kiting at Anub’Rekhan, vanilla WoW his hunter always had to do it and now he ends up tanking her. Think he must be sick of hearing “”Yes, run! It makes the blood pump faster!”. I got a shiney new cloak around 1 hour after I spent 100 gold enchanting the last one. Still not sure about the darkglow enchant thingie, but healing cloak enchants are somewhat lacking in excitement factor. (Edit: tested over the course of an Obsidian run, it gave exactly the same amount of mana as my meta gem, so between both of them I got 16k mana – ok that includes trash but since the meta gives double the mana, the cloak enchant must proc twice as often). 2. I hate the sons of Hodir. If it wasnt for an ice mammoth, I would be so tempted to take inscriptions just so I can skip out on their horrible horrible dailies. 3. The Maiden of Grief is a griefer, manaburning b***h. However with some perservence, sneakiness and thumping your keyboard extra hard she is two mannable on heroic. Still hate her though. No wonder shes all alone in a back room in the Halls of Stone, no one wants to play with such a meanie. 4. Dalaran is too small for all the people running around in it, one of these days one of the mages will sneeze and down will come dalaran, cradle and all. 6. We are now up to 6 heroic bosses defeatable as priest/warrior combo. 3 in the Nexus, 1 in the Occulus and 2 in the Halls of Stone but think we are running out ones that don’t test dps too much to be possible. That said we are getting faster and faster at killing the ones we can kill. Our first kill of Ormorok the Tree-Shaper was around 7 minutes, now we are down to 5 minutes. 7. 25 mans are easier than their respective 10 man versions. Anyone else feel thats a bit odd? 8. Obsidian Sanctum with all dragons dead is welfare loot. It actually makes all the effort I went through to get my season 1 on an alt look painful. That said, really enjoyed getting back into raiding. Its been a breeze really, relaxed and fun without a single drama filled second… I can only hope it continues that way. Where once it took 40 heroes, now it takes 2 slightly less heroic types. Techinically Lylia could probably have done it solo since all I did was stand 40 yards away tapping my foot.. prot warriors need more DPS. Magmadar proved similiarly easy, its hard to believe our MT who happily smashed his way through BWL, AQ40 and Naxx the first time around used to cry like a little girl if we didn’t have a dwarf priest in the raid for doggy killing time. 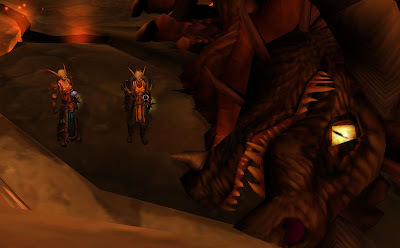 Fun fact: My first ever Rag kill took place on the 6th of Jan 2006. Looks like the place has gone downhill since then.